A case of a patient with primary lymphoedema where the scan pattern could have easily been confused with that of secondary lymphoedema is presented. This image pattern though occasionally seen has not previously been reported. Qualitative lymphoscintigraphic image evaluation and interpretation yields specific image patterns associated with primary lymphoedema (e.g. aplasia or hypoplasia) or secondary lymphoedema (e.g. post surgical or post traumatic). An awareness of these patterns is crucial to making correct scan interpretation and accurate diagnosis. We present a case of a patient with primary lymphoedema where the scan pattern could have easily been confused with that of secondary lymphoedema. This image pattern though occasionally seen has not previously been reported. 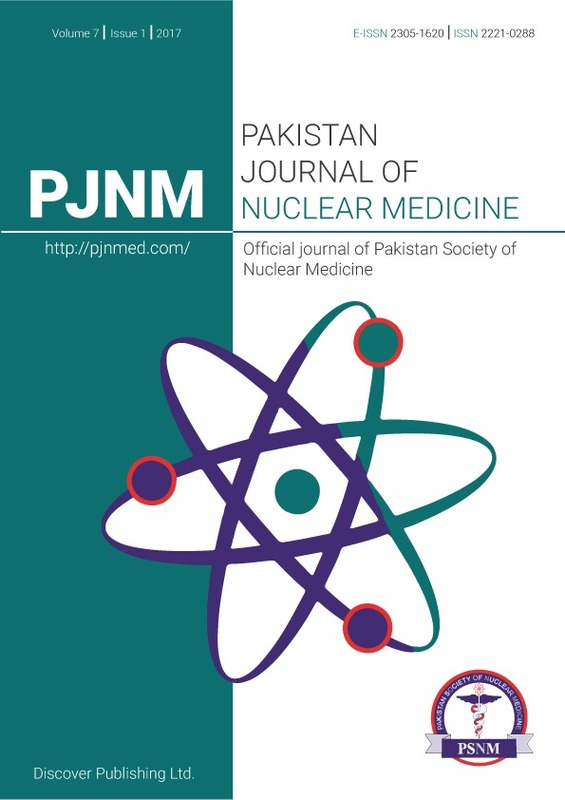 A 26-year-old female with left lower limb oedema of 16-month duration was referred to the nuclear medicine department at the Farwania Hospital Kuwait, for lymphoscintigraphy to determine the underlying cause of her lower limb swelling. 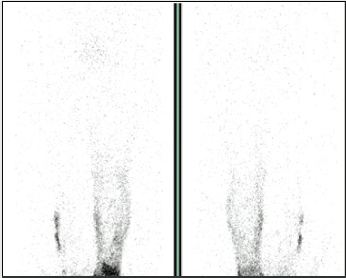 Dynamic lymphoscintigraphy was performed for 45 min following bipedal injections of 99mTc-Nanocolloid into the first interdigital web spaces of the feet. Next, pre- and post-exercise static lower half-body scans were acquired. The early flow images did not show inguinal lymph nodes on either side, nor any activity in the lymphatic channels (Figure 1). The delayed post-exercise images showed appearances suggestive of dermal backflow in the left mid thigh (Figure 2). On the right, there was no activity seen above the mid calf level with apparent patchy dermal back flow only to this level. On careful review of the images, the pattern of the pooling of activity in the skin was seen to be significantly different than the classic dermal backflow pattern (Figure 3) and the appearances were in keeping with cutaneous lymphatic microcirculatory flow through the lymphatic to flow through dilated dermal lymphatic channels in secondary lymphatic obstruction (Figure 3). A diagnosis of bilateral congenital lymphoedema secondary to lymphatic aplasia/hypoplasia was established. Normal extremity lymphatic drainage occurs through: 1) the superfical (epifascial) lymphatics that drain the skin and the subcutaenous tissue and 2) deeper lymphatics which drain subfacial structures . Radiocolloid particles following subcutaneous injection will be transported through the superficial lymphatics into the lymphatic channels. In secondary lymphoedema due to obstruction of the lymphatic channels, there is “backflow” of lymph at and below the level of the obstruction, from the lymphatic channels into the dermal lymphatics, giving rise the pathognomic “dermal backflow” sign, which is typically seen as increased uptake in the skin with dilated dermal lymphatics and an abrupt or “spirit level” type cut-off (Figure 3 shows the typical “dermal backflow” in a patient with secondary lymphoedema). However, in primary lymphoedma, where there is aplasia or hypoplasia of the primary lymphatic channels, the lymphatic flow is reversed with predominant preferential flow through the dilated cutaneous epifascial lymphatics. 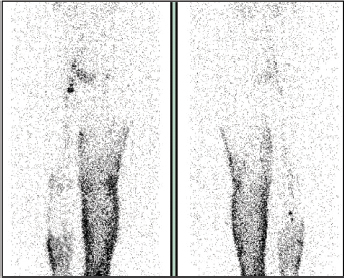 This cutaneous lymphatic flow is characterised by diffuse increased superficial uptake ascending upwards toward the thigh without any cut-off as can be seen in Figure 2. In the absence of obstruction the normal physiological flow through the superficial and the deeper lymphatic networks remain separate; however, there is preferential flow through one or the other lymphatic network depending on the nature of the obstruction (primary vs. secondary). Dermal backflow is a feature of secondary lymphoedema and is absent in primary lymphoedema. This new image pattern of “cutaneous flow” on delayed imaging in primary lymphoedema that mimics the “dermal backflow” pattern in secondary lymphoedema has to date not been reported. An awareness of this “cutaneous” flow pattern is important for correctly diagnosing primary and secondary lymphoedema cases through qualitative image evaluation and interpretation of lymphoscintigrams. Szuba A, Shin WS, Strauss W, Rockson S. The third circulation: radionuclide lymphoscintigraphy in the evaluation of lymphedema. J Nucl Med 2003; 44(1): 43â€“54.